Several years ago whilst undertaking my Diploma of Family Historical Studies with the Society of Australian Genealogists I was searching for certificates of family relatives in Victoria. I was able to locate several marriages that occurred within that state, by using the Victorian marriage index on CD-ROM. Having the registration numbers in hand, I proceeded to the Births, Deaths & Marriages Victoria website. Using a reference number (VICBDM Marriage Reference 1885/4665) and names for one of the marriages I had on file, I proceeded to pay for and download the PDF document containing the scan from the original register. Within five minutes I had an A3 printout of the certificate (shown below). With marriage certificates received this way, there are two additional entries on the page besides the one that you ordered and in rare situations, such as this, you strike it lucky. The following is a transcription of the first Victorian marriage shown in the image above between Peter William Auld and Rose Mitchell. Peter and Rose were married 11 July 1885, with the marriage registered in the Registration District of Bourke. A transcription of the third Victorian marriage shown on the page image above between James Wallace Auld and Harriett Stevens follows. 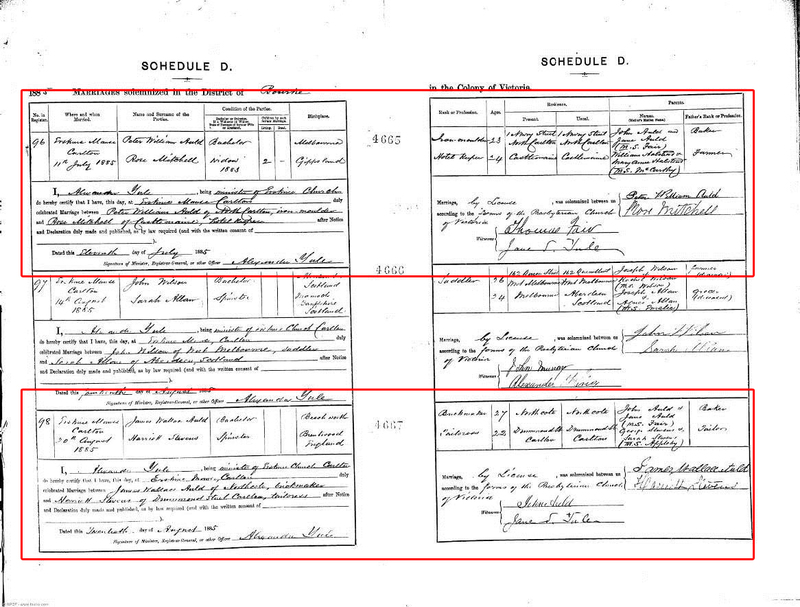 As above, the marriage was registered in the Registration District of Bourke, with James and Harriett being married on 20 August 1885. This article first appeared in the Hawkesbury Crier, June 2006 edition, pp. 25-26.